All GAP lighting products meet CE and RoHS approval. CE (European Conformity) is a mandatory conformity marking for certain products sold within the European Economic. RoHS is the Restriction of the Use of Certain Hazardous Substances. It restricts the usage of certain hazardous substances in electrical and electronic equipment. Cree leds define the metrics by which all other leds are measured. Cree leads the industry in brightness, efficiency and reliability, and it is for these reasons that GAP Lighting uses Cree technology in over 50% of our LED products. Epistar is a global brand with an accumulation of over 10 years experience. GAP Lighting incorporates this innovative and highly versatile technology into many products within our collection. Nichia has over 15 years of experience creating LEDs which undergo a unique production process via a rigorous quality control ensuring products of the highest quality. Bridgelux leds are created upon a strong foundation of research and world class engineering. Their aim is to create high quality lighting solutions and an optimum quality lighting experience. Osram is a multinational lighting manufacturer founded in 1919. One of the main products of the company is their leds which are highly efficient, have a low power consumption and high colour saturation without filtering. Citizen is a well-established LED manufacturer with over 20 years of experience. Their leds are highly reliable and eco-friendly. GAP Lighting uses responsibly sourced materials in compliance with European Conformity (CE) to ensure our products have met the appropriate health, safety and environment guidelines. Our products are also in compliance with RoHs restrictions which prohibit the usage of hazardous substances in our products. The quality ‘stainless’ is characterised by the arrangement of atoms known as its metallurgical structure. Grades of steel are selected based upon their corrosion and mechanical properties. Stainless steel is an alloy of Iron with a minimum of 10.5% Chromium. Chromium produces a thin layer of oxide on the surface of the steel known as the passive layer. This layer prevents any further corrosion of the surface. By increasing the amount of Chromium, this in turn increases the resistance to corrosion. GAP Lighting only uses highly durable, quality 304 and 316 grades of stainless steel. Both grades are austenitic, non-magnetic and thermally non-hardenable. Grade 304 can be used in an “as welded” condition. Grade 316 steel is marine grade and possesses excellent toughness and welding characteristics. The distinguishable characteristics between 304 and 316 is the addition of molybdenum up to a maximum of 3%. Therefore 316 is a higher grade suitable for high levels of exposure to the elements. Die casting is the manufacturing process of producing metal parts by forcing molten metal under high pressure into a die cavity. Die-cast aluminum parts are much stronger than their plastic counterparts with outstanding corrosion resistance and thermal conductivity. They are made to withstand high temperatures and have a good stiffness and strength to weight ratio. Die-cast aluminum is a sustainable alternative to plastic as on average 95% of the metal is sourced from recycled materials and is fully recyclable. IP (Ingress Protection) rating refers to the level of product protection from external factors. Each IP rating is followed by a numerical code which details the level of protection from both solid and liquids. The first digit refers to the level of protection from solid external factors including protection from dust, tools and other solid objects varying in size. The lowest level 0 offers no protection and the highest level 6 provides complete protection. The second digit refers to the varying levels of protection from liquids including the degrees of water pressure, immersion depth and water volume. The lowest level is 0 offering no liquid protection and the highest level 8 provides immersion protection to a level specified by the manufacturer. Protects from objects greater than 12mm and offers no protection against liquid. Products with an IP20 rating are suitable for interior application. Protects from objects greater than 1mm including tools and small wires. These products offer protection from multi-directional water spray. IP44 products are suitable for interior and exterior application. These products offer total protection from exterior dust. They offer protection from low pressure multi-directional water jets. IP65 products are suitable for interior and exterior application. They offer liquid immersion protection between 15cm and 1m in depth for a maximum of 30 minutes and are suitable for interior and exterior application. They provide protection for long term water immersion up to the particular product pressure specified by the manufacturer. IP68 products are suitable for exterior and interior application. Depending on the building construction, ceilings in any of these premises may be required to have a fire-rated downlighter. 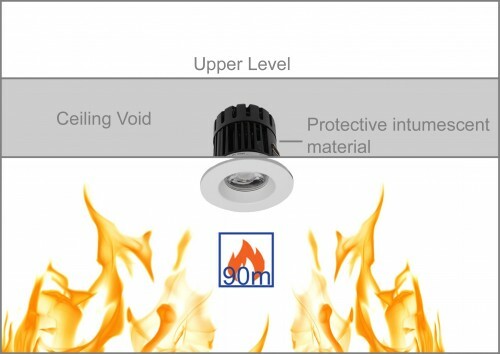 It is a legal requirement to install a suitable fire-rated downlighter as this could save lives. Fire-rated downlighters are crucial in preventing the internal spread of flames to the spaces above a ceiling. They contribute to the safety of the internal constructions of the premises. It is therefore vital that they do not affect these structures as this could be hazardous to fire safety. The purpose of the fire-rated downlighters is to prevent the spread of fire through the downlighter itself. Intumescent material expands and seals the downlighter ventilation holes, so that the ceiling’s fire-resistant integrity is maintained. The height of the top floor or the depth of the basement will determine the period of fire resistance that is required. GAP Lighting’s DLX10, SOUND 8 and CLOUD 8 are all fire-rated downlighters that have 90 minutes fire protection and are therefore suitable for all property types in the vast majority of circumstances. 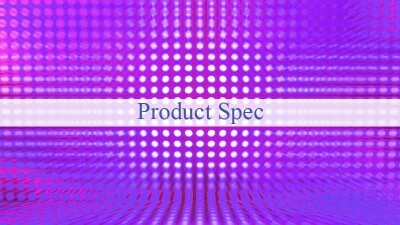 For further information regarding our products specification, please refer to our products page.